Race skins for wide skis! 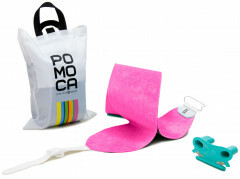 The Pomoca Race Back Fix is the easiest way to apply the buttery glide of your race skins to bigger planks. Ideal for clocking the fastest powder laps and skiing objectives when time is crucial, but you still prefer to bring your wider skis. The Race Back Fix functions perfectly as a mid-winter skin for your powder boards or a supplemental skin for long approaches on your spring skis. The tail is already attached, so just cut to length, add the tip kit, and trim the edges with the included offset cutter. The go rock your powder boards like you mean it. If you like big skis and you cannot lie, grab a Pomoca Race Back Fix kit and you’ll be able to enjoy the fruits of your labor a bit sooner. Adjustable tail clip is user-friendly and tensions to avoid snow buildup underneath the tails. Included Pomoca Cutter has an offset built-in to expose just enough edge for proper grip. Tip bracket is sturdy and easy to install after cutting the skins to length. Attach to your skis with Pomoca reliable and easy-to-manage glue. The skin material measures 120mm wide.